Soup season is finally here, all I’ve been wanting to eat last few days were hot and cozy SOUPs!! 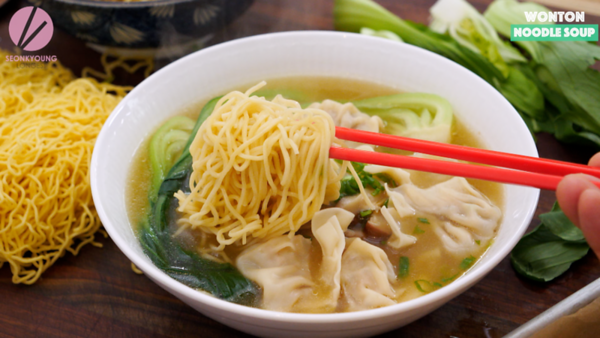 I’ve shared wonton soup recipe and you all LOVED it so much, I decided to share another easy and fast soup recipe, which is… Wonton Noodle Soup! 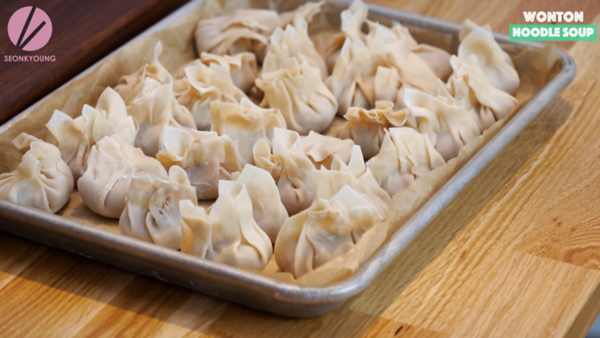 The wonton recipe is a bit different and larger, it makes more wontons than you need, so you can either freeze them, simply just boil in water or fry them to enjoy by themselves too! 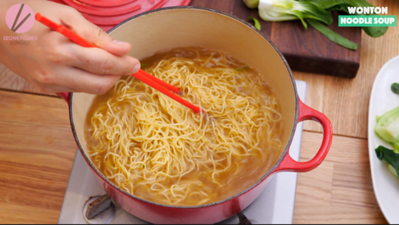 So excited to share my wonton noodle soup recipe with you, so let’s get started! 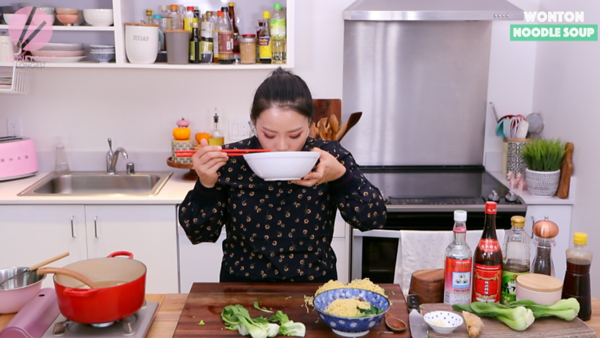 First, let’s make the star of the dish, wontons! First chop shrimp until it’s pasty. It will happen faster than you expected! 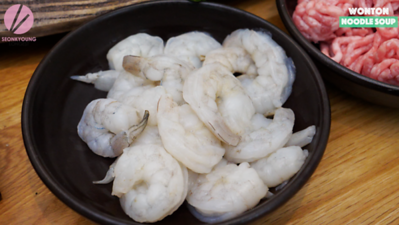 Now, add the chopped shrimp in a large mixing bowl along with ground pork, garlic, ginger, green onions, cornstarch, soy sauce, sesame oil, shaoxing wine, sugar and black pepper. 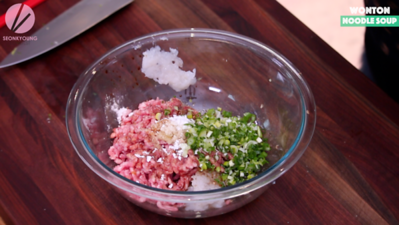 Mix well with fork or chopsticks in one circular direction. Alright, it’s wrapping time! 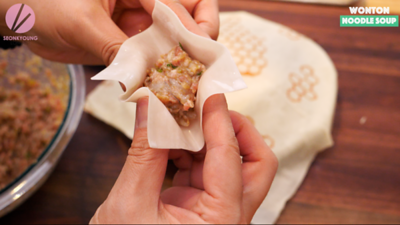 You will need square wonton wrapper for this recipe. Now days, this wonton wrapper are EVERYWHERE! You shouldn’t have a problem to get one… cuz even the Walmart in Tell City, IN has it!! 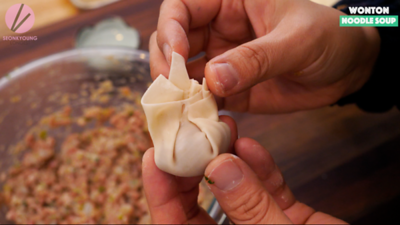 Bring one dumpling wrapper at a time one your palm and we the edges slightly with water. Place 1 heaping teaspoon filling in the middles and fold by bring all the edges together. 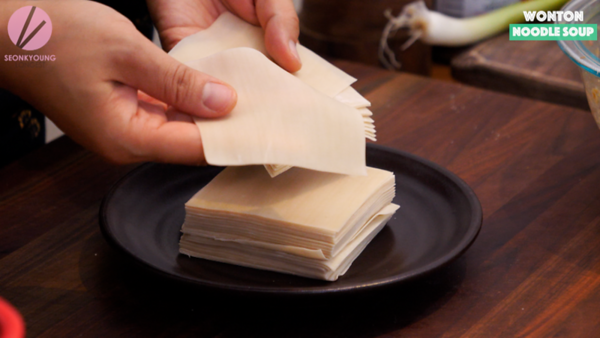 No special skill required for this type of wonton, just makes sure it’s well sealed. If you would like to freeze the dumplings at this stage, place dumplings on a baking sheet as one layer and not touching. Then freeze them a couple hours. 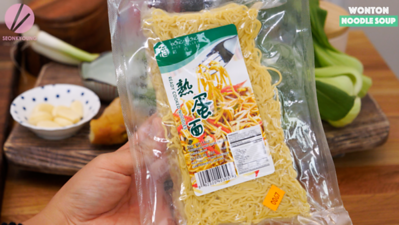 Transfer frozen dumplings in a air tight plastic bag and seal tight. Keep it freeze. 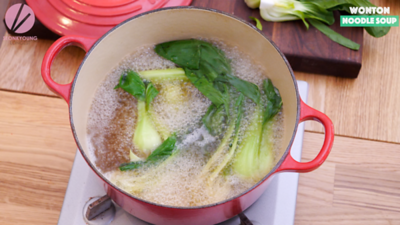 When then wontons are ready, it’s time to make the noodle soup! In a medium – large pot (for 2 portions), combine ginger, garlic, green onions, shiitake and chicken stock. Cover and bring it to boil, reduce heat to medium low and simmer for 5 to 10 minutes. 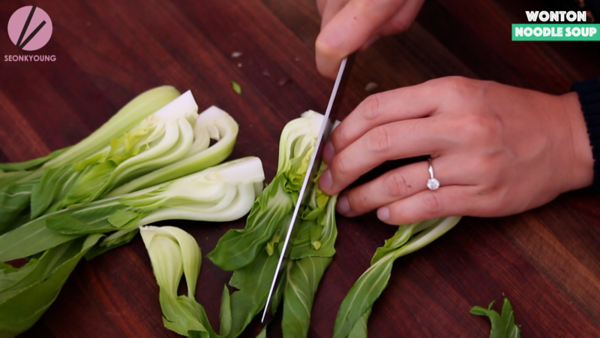 Meanwhile cut the bok choy into quarter. Remove all solid ingredients and discard except shiitake. 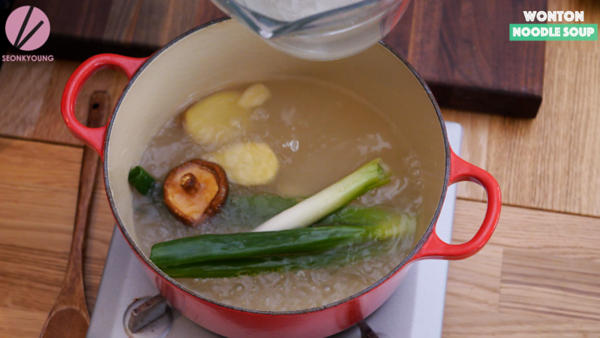 Slice the shiitake and set aside, because we’re going to serve in the soup! Season the soup with soy sauce and fish sauce. You can use only soy sauce if you want, I just prefer the flavor from both. 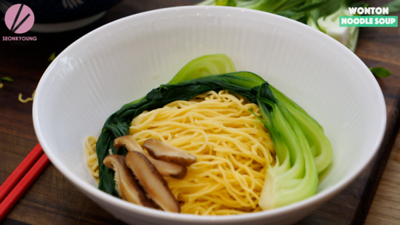 Cook the egg noodles and bok choy in a separate boiling water, if you are cooking large amount or/and your egg noodles are dried or fresh one with lots of starch around. I’m using precooked egg noodles, so just cooked in the soup for 1 minute. Removed from the soup and place in a serving bowl. 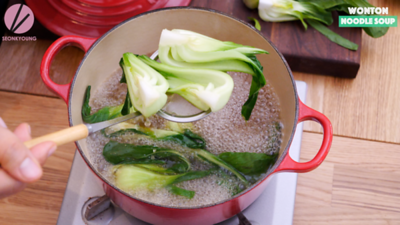 I also cook the bok choy in the soup for 2 to 3 minutes or until it’s done as you desired. 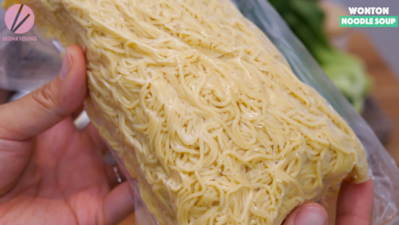 Remove from the soup and place on top of the noodles. Now is the time to place sliced shiitake in the bowl. 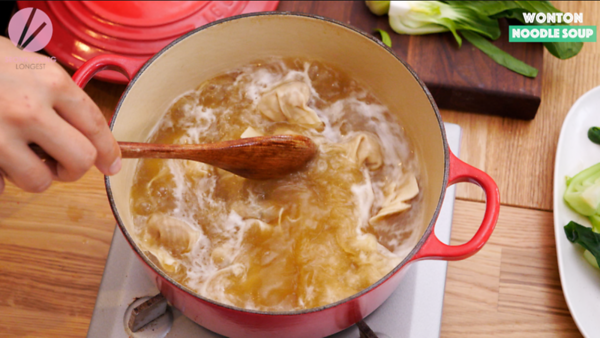 Carefully add wontons (5 per serving) into soup and cook for 5 to 6 minutes. Taste the soup and add salt and pepper to your taste at this point. 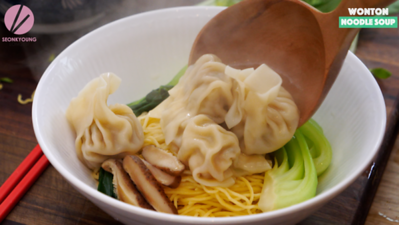 Pour the wontons with the soup over the prepared noodles and veggies. Garnish with chopped green onions if you like. 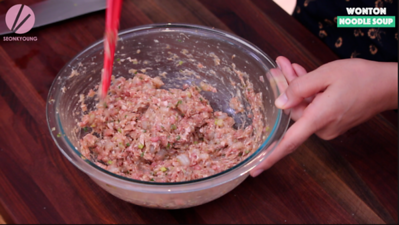 In a mixing bowl, combine all ingredients for wontons except the wonton wrappers. 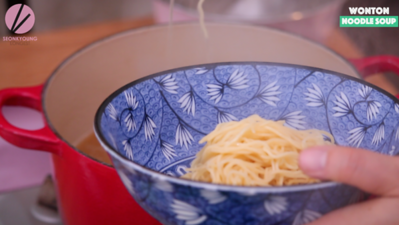 Mix well with fork or chopsticks in one circular direction. 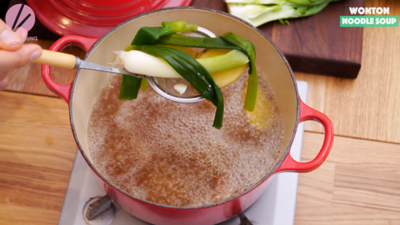 In a medium - large pot (for 2 portions), combine ginger, garlic, green onions, shiitake and chicken stock. Cover and bring it to boil, reduce heat to medium low and simmer for 5 to 10 minutes. 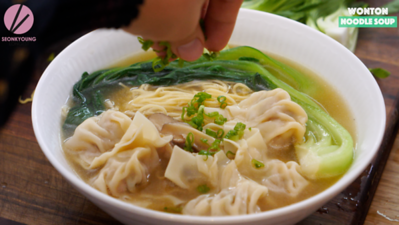 Pour the wontons with the soup over the prepared noodles and veggies. Garnish with chopped green onions if you like. Enjoy! I looove Wonton noodle soup! I am planning to try your recipe. Thanks for sharing. I would just like to ask you if I can leave out the shaoxing wine? Or is there any other substitute to that other than dried sherry? Yes you can leave out! Made the wonton soup the other day, Oh yum. I was wondering if you ever used black beans for the filling in place of meat? Asking for a friend. Hi! 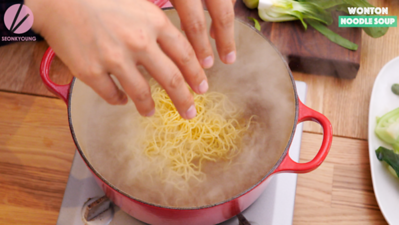 I love your recipe and will cook wonton noodle this weekend. 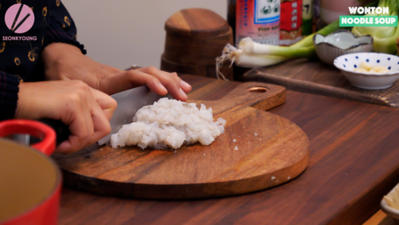 However i also saw other recipe videos and find out that most of them cook with daikon in the soup. Can i ask you why u decide to leave that out? I just made this for dinner and oh. My. Goodness. It was so delicious! My 4 yo twins slurped it up and said they loved the wontons the best. Will definitely make this again. Love your wonton soup! Can’t wait to make it with your bbq pork! Curious if I freeze the leftover wontons, can I put them in the soup frozen or do I need to thaw them out (and if so, what’s the best way to do that so they don’t mushy). Thank you!